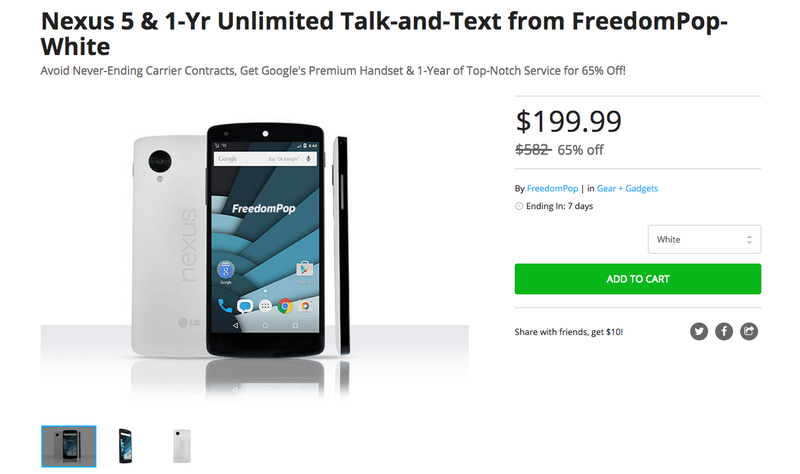 If picking up a certified pre-owned Nexus 5 16GB, that also comes with a year-long subscription to 500MB of high-speed 4G LTE data a month from FreedomPop sounds like a good deal, a new listing on the DL Deals Store should interest you. The Nexus 5, as you all should know, is the Nexus device that launched a year before 2014’s Nexus 6 from Google. It is a low-priced, hardworking smartphone that for $200, is a pretty good deal. Now, the FreedomPop connectivity that comes with the device is on Sprint’s LTE network, with 500MB of 4G LTE data per month. The service also includes 1 year of visual voicemail, 1 year of tethering, and 1 year of usage alerts. You pay nothing extra for this service, as it comes coupled with the device thanks to a SIM card right out of the box. For more info on FreedomPop, or if you have any questions that need answering, check out their support page here. If paying just $200 for a Nexus 5 and a year of service sounds agreeable, go grab it. Update: The Black model of the Nexus 5 has sold out. If you order now, you will receive a White Nexus 5.